A political battle is brewing quietly but fiercely across the State of California. It is scheduled to erupt in Alameda County the last weekend of this month. It is part of the upheaval that started in the Democratic Party in 2016. That year saw an epic battle between Hillary and Bernie. When Bernie lost that battle, political activists across the country known as “Berniecrats” made 1 of 2 choices: leave the Democratic Party or stay and try to reform the Party from inside. Their choices set the stage for the next battle: the ADEM elections in January 2017. “ADEMS” is short for Assembly District delegates. Inside the Democratic Party, each Assembly District can elect 14 delegates to the State Party. In 2017, the well-organized Berniecrats won – they swept the ADEM elections with slates of progressive candidates across the State. In 2019 and 2020, the ADEMS elected to the State Party will make two critical choices: (1) who will lead the State Party following the resignation of the disgraced Party Chair; and (2) who will be endorsed for President by the California Democratic Party. The stakes are high and the battle is intense. In Assembly District 18 (AD18), the incumbent slate of progressives who won in 2016 is facing a stiff challenge organized by Assemblyman Rob Bonta. 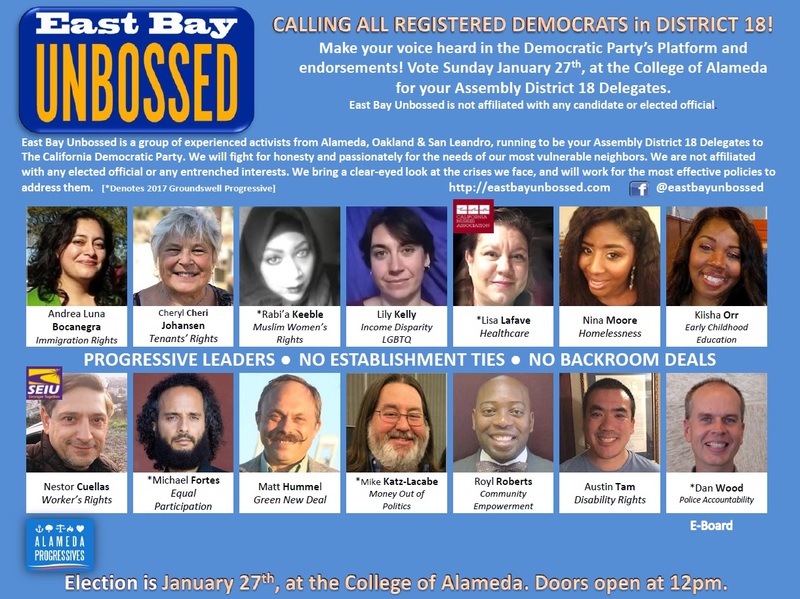 The “East Bay Unbossed” slate includes 5 members of the original progressive slate that won in 2016 – Rabi’a Keeble, Lisa Lefave, Michael Fortes, Michael Katz-Lacabe and Dan Wood. They have been endorsed by a 6th incumbent member, Gaby Dolphin, the President of the City of Alameda Democratic Club. Matt Hummel, recent candidate for Oakland City Council, District 4. Others new to the East Bay Unbossed slate include Cheri Johansen, a tenants’ rights organizer, leader of Alameda Progressives and the manager of the successful No on K Campaign in Alameda, Lily Kelly, an LGBTQ activist, Austin Tam, a disability rights advocate and Nestor Cuellas, a worker and tenants’ rights activist. Other notable ADEM candidates not running on either slate include East Oakland rising star, Mya Whitaker (who impressed many in her run for Oakland City Council District 6) and Meredith Orthwein. Asm. Bonta is challenging the incumbent progressives with his hand-picked slate of candidates, and he is financing their election. The Bonta slate is heavy on electeds. It includes newly-elected Oakland City councilpersons Sheng Thao and Nikki Fortunato Bas as well as newly-elected officials from Alameda. Asm. Bonta already gets to appoint 5 delegates who can vote his wishes in 2019 and 2020 just because he’s an elected official. If the Bonta-financed slate wins, Bonta will have a total of 19 votes to cast in 2019 and 2020 party elections. I endorse the East Bay UnBossed slate because the Democratic Party is sorely in need of independent leadership and new voices, not simply elected ones. The State Party suffers from the outsized influence of its elected members. The ADEM slots are one of the few places where grassroot leaders with ties to the community can actually influence the party. In my view, ADEMs need to be independent to have that influence. The AD15 ADEMS election is Saturday, January 26th from 10:30 to 12:30 at the Emeryville Center of Community Life (ECCL) Gymnasium, 4727 San Pablo Avenue. AD18 voters will decide on Sunday, January 27. Elections will be held from noon to 2:45 at College of Alameda – Building F Student Lounge, 555 Ralph Appezzato Memorial Parkway in Alameda. Doors open at noon. You must be in line by 2:45 pm to be able to vote. For a complete list of all of the “unbossed” progressive slates across the State, go to adems.vote. For all those who have been cheering the advancement of progressive candidates across the country, here is another chance to move Alameda County in the right direction. I hope you take it!